Longtime X-Man and Avenger Hank McCoy, a.k.a. 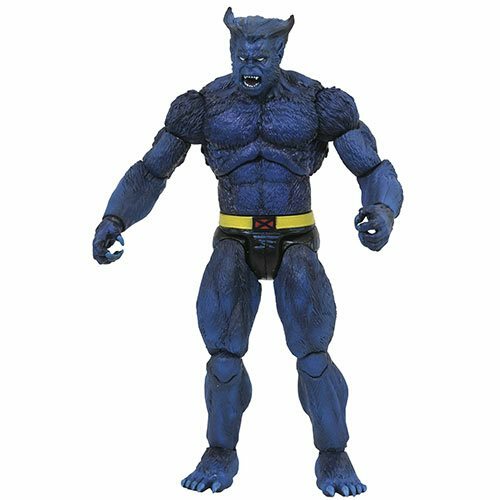 Beast, joins the long-running Marvel Select action figure line, adding to the already extensive X-Men line-up. Featuring approximately 16 points of articulation and interchangeable hands, the 7-inch figure comes with a section of the Danger Room, with climbing bars for the team's resident super-genius gymnast. Combine it with the other X-Men's sections of the Danger Room to forge a larger diorama! Packaged in the famous Select packaging, with side-panel artwork for shelf reference.